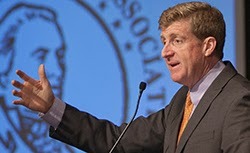 Speaking to the APA Assembly the day after Friday's release of the final rule implementing the federal mental health parity law, the law's chief sponsor, Patrick Kennedy, emphasized that "while the final rule may have been written, the final word on mental health is not yet written." It will have to be written by psychiatrists "on the front lines" who battle to make mental health care as routine as the rest of medical care, he told Assembly members. He lamented the stubborn stigma that still attaches to mental illness as well as the thousands of suicide deaths that could be prevented every year if people weren't ashamed of having an illness affecting the brain rather than other parts of the body. He added that it was appropriate to use the slogan that AIDS activists used in their fight against stigma a couple of decades ago: "Silence = Death." Kennedy, a former member of Congress who fought for 12 years to get the mental health parity law passed, said that the battle against mental illness discrimination "is part of the march toward progress embodied in the civil rights movement in our country and in the historic human rights movement that occurred in South Africa." "What you're fighting for at APA," he said, "is giving a connection to human beings who feel marginalized because their illness is so shamed and stigmatized, much like Americans who are marginalized because of the color of their skin, their gender, their sexual orientation, or their religious ethnicity." He ended by describing how receiving mental health treatment changed his life for the better, allowing him to experience the joy of seeing the parity law enacted, its final rule issued, and of being a father able to give his children the foundation in life that all children need. Kennedy now serves as a senior advisor to APA.